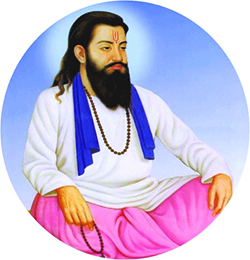 Shri Guru Ravidass Ji was a North Indian Guru mystic of the bhakti movement who was active in the 15th century CE. Venerated in the region of Punjab, Uttar Pradesh as well as Maharashtra, his devotional songs and verses made a lasting impact upon the bhakti movement. He is often given the honorific Bhagat or Sant. He was a socio-religious reformer, a thinker, a theosophist, a humanist, a poet, a traveler, a pacifist and a spiritual figure before whom even head-priests of Varanasi (Benaras) lay prostrate to pay homage. 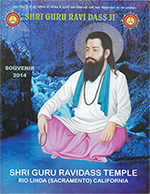 Shri Guru Ravidass Ji was born in the Kutbandhla Chamar caste. His devotional songs were included in the Sikh Scriptures, Guru Granth Sahib. There is also a larger body of hymns passed on independently that is claimed and attributed to Shri Guru Ravidass Ji Ji. 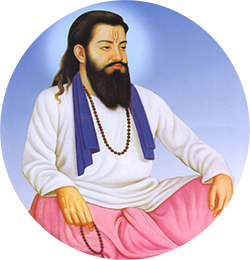 Shri Guru Ravidass Ji was subversive in that his devotionalism implied a leveling of the social divisions of caste and gender, yet ecumenical in that it tended to promote crossing of sectarian divides in the name of a higher spiritual unity. Guru Raviass Ji taught that one is distinguished not by one's caste (jāti) but by one's actions (karma) and that every person has the right to worship God and read holy texts. He opened a frontal attack against the system of untouchability. He rejected the tradition of Brahmin mediator to reach the Supreme Being. He also said that one need not to hide his caste or leave his low profession to reach God. He became a model for his fellow beings to overcome the hierarchical barriers of Brahminical social order and to establish Begumpura - a state without fear and sorrows. Shri Guru Ravidass Ji elevated the status of the labour by emphasizing on the fact that honest labour is empowering.